The average American consumes more than 34 pounds of cheese annually, according to USDA. This is a 43% increase over the past 25 years. In addition to innovative applications and recipes—beyond burgers, pizza and tacos—new forms and flavors are driving this consumption. What’s helping are the multiple placements of cheese around the perimeter of the supermarket, beyond the dairy and deli departments. Creative merchandising keeps cheese relevant with today’s consumers, in particular Millennials and Gen X. 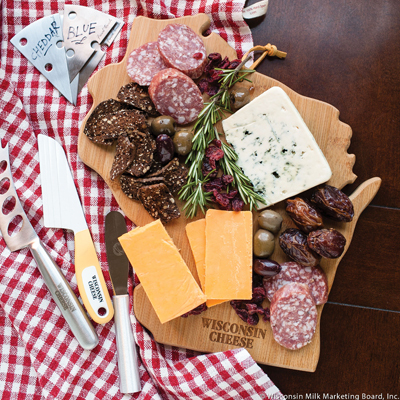 Here are five trends fueling cheese innovation to help further drive sales. 1. Charcuterie. From prosciutto to salami, cured and dried meats and sausages are a booming business. Some of this is because making charcuterie is as much of an art as it is a science and today’s foodie consumers are fascinated by the time and technique involved. What best accompanies charcuterie? Cheese. Restaurants and consumers are seeking out convenient cuts and bold flavors to make appetizer boards and trays. Sharp cheddars, which come in many degrees of sharpness, complement the tangy, fermented tastes of many charcuterie products. Get creative with packaging and merchandising. Work with retailers to have product near charcuterie cases. Offer pairing ideas and even recipes. 2. Mediterranean Cuisine. The growing popularity of Mediterranean cuisine, which includes the flavors of countries surrounding the Mediterranean Sea, such as Greece, Turkey, Lebanon, Levant and Syria, is apparent by the number of supermarkets that now offer antipasti, charcuterie and olive bars, foods that are indigenous to this region. Many retailers also offer an overwhelming array of dips, sides, condiments and cheese, namely feta and fresh mozzarella. 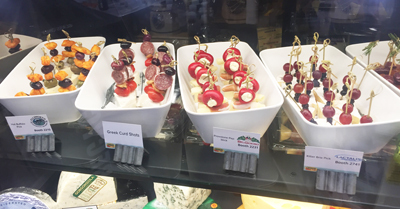 This food trend presents service deli operators and in-store cheese mongers with the opportunity to provide snacking and meal solutions featuring marinated and seasoned cheeses for Mediterranean dishes. It also creates an opportunity to offer such seasoned cheeses on food bars, alongside traditional Mediterranean foods such as gyros, kabobs and shawarma. 3. Breakfast. Wake up and smell the bacon or sausage and taste the melted cheese. That’s what’s trending during the breakfast daypart. Today’s consumers know that protein is a great way to start the day and they are embracing all types of breakfast meats and cheeses. Similar to other dayparts, consumers also crave flavor adventure in the morning. This presents an opportunity for cheesemakers to offer new flavors, formats and pairings for the first meal of the day. This is driving innovation of protein-dense foods designed for dashboard dining, as well as heat-and-eat meals for convenience. What about a bacon and cheese bar or maple syrup and waffle-battered cheese curds? 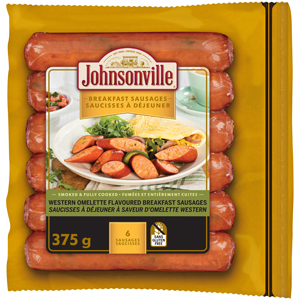 For example, Johnsonville, Sheboygan Falls, Wis., has a new Western omelet breakfast sausage in distribution in Canada. Starting with a base of ground pork, this sausage packs in onion, green bell pepper, cheese, scrambled egg and spices that would be included in a Western omelet. 4. Natural, Minimally Processed, Simple. Natural has remained a top influence for shoppers around the world, but communications are shifting, according to a new report from HealthFocus International. Increased scrutiny of vague natural claims and the general overuse of the term within the food and beverage industry has fueled the clean-labeling trend as shoppers look towards other cues to signal that a product is more natural (e.g., organic, non-GMO, fewer ingredients, minimally processed, no artificial ingredients, etc.). Front-of-pack statements are becoming more specific in order to communicate to shoppers what the product is free from as well as what it contains. Although communications are changing, according to the report, the importance of natural remains as shoppers demand transparency and increasingly seek out “real” foods. It’s no wonder why there’s so much innovation taking place in the natural cheese sector. Consumers recognize the simplicity and naturalness of cheese and are embracing it as an all-day snack. It helps that cheese is also loaded with satiating protein and bone-building nutrients. 5. Snacking. That brings me to snacking, which continues to eat away at the traditional three meals a day dining format. For many consumers, cheese is an important snack. Just look at the plethora of multi-compartment cheese packs invading the dairy department. Many new cheese snacks include meat, nuts and dried fruit. To read more about snacking and view a slide show of cheese snacks introduced at IDDBA, link HERE to an article I wrote for Food Business News. The time is now to get creative with cheese! Among many disheartening news items this week, there was a story out of San Francisco announcing that The Golden City’s middle and elementary schools, effective this August, will have their flavored milk privileges revoked. In the spring, high schoolers will also no longer be able to enjoy the nourishment and rehydration of nonfat chocolate milk, the only type of flavored milk that had been served the past few years. The reason cited: sugar content. The Los Angeles school district tried a similar ban in 2011, but after watching students dispose of either unopened or barely consumed white milk cartons, the school brought either nonfat chocolate or strawberry milk back this past school year. It’s been reported that school officials found waste was reduced by 23%. San Francisco officials say they tested the new policy in some schools this past year and the waste was very minimal. The dairy industry knows better. Study after study has shown most school-aged milk drinkers prefer flavored—usually chocolate—milk. Here’s something else the dairy industry knows. Low-fat milk, even as low as 1% milkfat, tastes better than nonfat milk. This is true for white and for flavored. And guess what? Delicious and healthful milkfat, as it contains many essential fatty acids, typically makes it easier to lower added sugar. Here’s the good news. In case you missed the big announcement, on May 1, 2017, the USDA’s new secretary--Sonny Perdue—said the agency will provide greater flexibility in nutrition requirements for school meal programs in order to make food choices both healthful and appealing to students. This includes getting 1% low-fat flavored milk back on the menu. The most important “flexibility,” as Perdue refers to this deregulation, for dairy processors is the ability to serve 1% low-fat flavored milk through the school meals programs. USDA is phasing this into the school milk policy. Another flexibility worth noting for dairy processors, namely cheese marketers, is with sodium. For school years 2017 to 2018 through 2020, schools will not be required to meet “Sodium Target 2,” which was part of the current school nutrition policy. Instead, schools that meet Sodium Target 1 will be considered compliant. Lastly, there’s now flexibility in meeting whole grain requirements. This is for schools experiencing challenges in finding the full range of products they need and that their students enjoy in whole grain-rich form. Sounds great, right? Flexibility is one thing, school boards are another! There are a lot of parents who prefer to not believe the consumption studies and the nutrition facts and simply want to make sugar—and fat—the enemy. Fluid milk processors need to invest in product development to produce a great-tasting, reduced-sugar 1% low-fat chocolate—and maybe other flavored—milks for school. There are technologies available to do this. 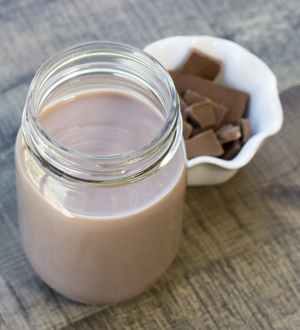 At the recent IFT held in Las Vegas, Kerry sampled a sugar-reduced chocolate milk solution that allows for up to a 30% reduction, while still delivering a rich, creamy taste. This solution works for flavored milk sold through all channels. 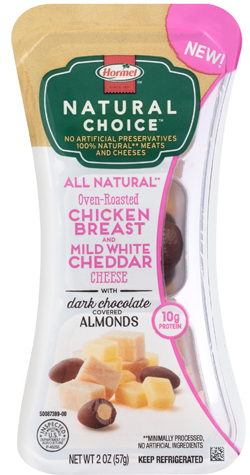 Flavored milk is one of the bright spots in the retail fluid milk case. Retail sales data from IRI provided to Dairy Management Inc., and courtesy of the Midwest Dairy Association, for the first quarter of 2017, show that flavored milk sales were up 3.5%. Whole-fat milk sales were also up (3.3%), as was lactose free (12%). These three formulations present a growth opportunity in the fluid milk category. What the data from the first quarter also showed was that the retail decline for overall fluid milk was a bit more pronounced than we have seen in the past two years, with sales down 3.3%. Volume leader, white gallon milk, is driving overall fluid milk declines. Other IRI data show that the volume of flavored milk sold through retail grew 15.8% between 2014 and 2016 and growth is continuing in to 2017. Flavored milk currently accounts for 10.5% of milk through all channels and 5.6% at retail. Four in 10 households purchase flavored milk during the course of a year. Flavor innovations, value-added formulations, and yes, lower sugar contents, may entice more households to give flavored milk a try. 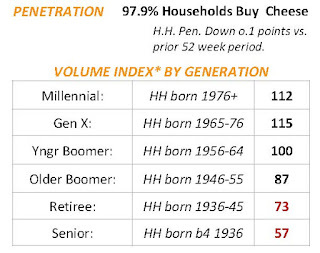 It’s important to note the life stage that is indexing as high volume users. It’s households with families, both young families and those raising teens. In fact, usage of flavored milk by households with 12 to 17 year olds is 77% higher than the national norm. 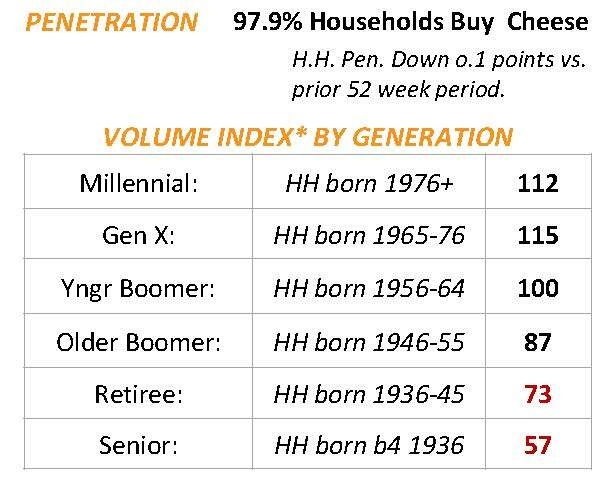 This data suggests there’s a huge opportunity to formulate for such households. Something else to also consider when marketing flavored milk, as well as all food and beverage, is touting the product’s clean-label attributes. “All-natural,” “non-GMO” and “no additives or preservatives” are the most common product attributes consumers associate with clean label, according to new research from Kerry. These are also attributes of most flavored milks. While more than half of consumers surveyed reported being familiar with the term “clean label,” just 38% indicated a strong understanding of its definition. Respondents connected product attributes ranging from “farm grown” to “sustainably produced” to “minimally processed” and “made with real ingredients” to “clean label,” demonstrating what a truly multidimensional opportunity it is for food manufacturers and brands. 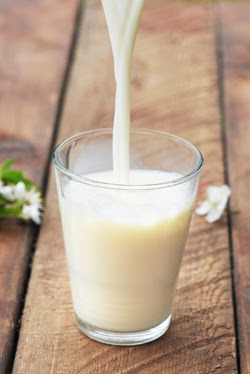 Keep inherently clean and simple farm-fresh flavored milk on the menu—in schools, in foodservice and the kitchen table. 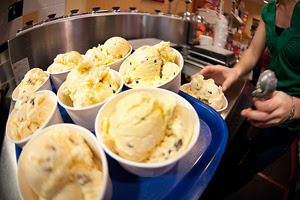 National Ice Cream Day is this Sunday, July 16. This U.S. celebration is observed annually on the third Sunday in July and is a part of National Ice Cream Month. Legend has it that ice cream was introduced to the U.S. by Quaker colonists who brought their recipes with them when they traveled across the Atlantic to the New World. Their ice cream was sold at shops in New York and other cities during the colonial era. 1813–First Lady Dolley Madison served ice cream at the Inaugural Ball. 1832–Confectioner Augustus Jackson created multiple ice cream recipes as well as a superior technique to manufacture ice cream. 1843–Nancy Johnson of Philadelphia received the first U.S. patent for a small-scale hand-cranked ice cream freezer. 1920–Harry Burt puts the first ice cream trucks on the streets. 2017–Protein-packed ice cream became a new segment in the crowded freezer case. That’s right! For the past five years or so, I have reported on protein-enriched ice cream innovations, some going by the descriptor frozen dairy dessert because of standards of identity. These innovations are available around the world, with the U.S. and U.K. leading the trend. In the past six months I’ve noticed an uptick in their popularity, as well as recognition in the press. Most recently, CNBC wrote about the success of Halo Top (a frozen dairy dessert) from Eden Creamery LLC. You can read the article HERE. The article explains how Halo Top’s success grew in 2016 after a GQ journalist wrote about eating nothing but Halo Top ice cream for 10 days. He lost weight and body fat, not muscle. The low-calorie, low-fat, low-sugar brand promises shoppers the indulgence of ice cream without the guilt or empty calories. And consumers are eating it up. In 2016, Halo Top sold 28.8 million pints, which generated $132.4 million in sales, according to data from IRI. 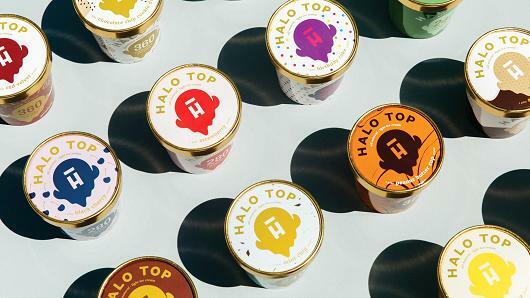 Pints of Halo Top, which contain four half-cup servings, provide 220 to 360 calories, 20 to 24 grams of protein, and 20 to 28 grams of sugar, depending on variety, of which there are 17. Most pints also contain 12 grams of fiber. Between the protein and the fiber, this dessert is designed to satisfy the sweet tooth and curb hunger pangs. The base mix for Halo Top consists of milk, cream, eggs, erythritol, prebiotic fiber, milk protein concentrate, organic cane sugar, vegetable glycerin, organic carob gum, organic guar gum and organic stevia. To read more about Halo Top, link HERE. I have long advocated that marketers need to do a better job of promoting ice cream—all ice cream—as a healthful dessert. After all, it inherently contains calcium and protein, and depending on the flavor, can function as a delivery vehicle for healthful foods such as nuts and fruit. Some recent protein-packed ice cream innovations include other nutrients, such as fiber, vitamins, minerals, omega-3 fatty acids, and even probiotics. Such better-for-you ice cream is not for everyone, but it’s definitely alluring to the growing health- and wellness- seeking consumer. This is why some of the larger players have taken note and are entering the category. After all, Nielsen data shows that retail ice cream sales reached $6.6 billion in 2016, up 3.4% from 2015. Conventional products are not the driver of this growth. It’s the better-for-you segment. CNBC reported that sales of products that fit within the FDA’s definition of “healthy” grew 85% in 2016. 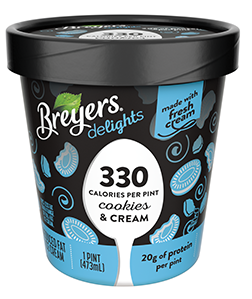 The biggest name to enter the category, and just in time for National Ice Cream Month, is Unilever with its new Breyers delights, which contains 260 to 330 calories and 20 grams of protein per pint. Available in four flavors, Breyers delights is promoted as being made with high-quality ingredients, naturally sourced flavors and all American dairy. Flavors are: Creamy Chocolate, Cookies & Cream, Mint Chip and Vanilla Bean. 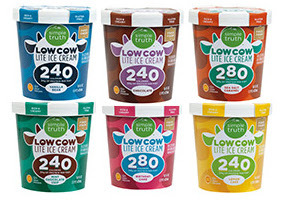 Supermarket giant Kroger wants part of the action and is rolling out private-label Simple Truth Low Cow Lite Ice Cream. It contains 75% less fat and 55% fewer calories than regular ice cream and is described as non-GMO, gluten free, and made with absolutely no artificial ingredients or preservatives. One pint contains 240 to 280 calories, depending on variety, and 24 grams of protein. Flavors are: Birthday Cake, Chocolate, Lemon Cake, Mint Chocolate Chip, Sea Salt Caramel and Vanilla Bean. At this year’s Institute of Food Technologists’ annual meeting and exposition, held in Las Vegas June 25-28, the U.S. 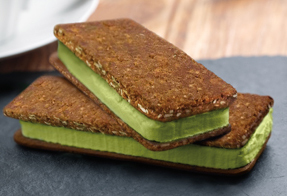 Dairy Export Council showcased a frozen matcha dairy sandwich. It featured a milk protein isolate-enhanced Greek yogurt filling flavored with matcha green tea wedged between crispy oat wafers. A single serving contains 15 grams of protein and is ideal as a frozen breakfast food or a high-protein snack. Also at IFT, Agropur Ingredients sampled Fro’duce, a scoopable fruit and vegetable probiotic sherbet with half the sugar of traditional sherbet. The lactose-free sherbet is made with whey protein isolate and milk protein isolate, with one pint providing about 10 grams of protein. 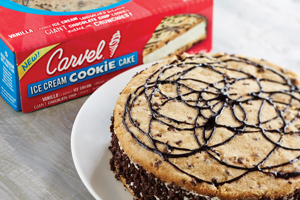 To kicking off National Ice Cream Month, Carvel is growing its retail line of ice cream cakes with Carvel Ice Cream Cookie Cake. The new, original treat is a first at grocery and combines two classic American desserts–vanilla ice cream and chocolate chip cookie cakes–to create the ultimate, sharable indulgence. Complete with Carvel’s famous crunchies around the outside, the new cake resembles a giant cookie ice cream sandwich. Similar to the ease of sharing a pizza pie, the ice cream cookie cake can be sliced, served and enjoyed without needing utensils. During National Ice Cream Month, Ben & Jerry’s fellow neighbors from Vermont, Phish, are gearing up to kick off a historic 13-night run of shows—dubbed the Baker’s Dozen--at Madison Square Garden in New York City. To celebrate the 20-year partnership with Phish, Ben & Jerry’s is honoring the band with a new very limited-batch donut-themed ice cream flavor: Freezer Reprise. The flavor is a sweet cream ice cream with a vanilla glaze, chocolate donut swirl, chocolate donut pieces and fudge fish. It will be available during the opening night of the run, July 21st, and on select days at special events surrounding the concerts. 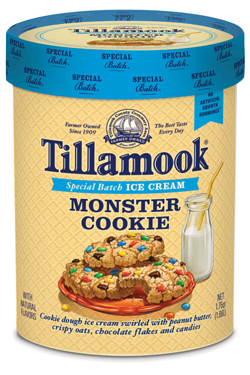 Tillamook is playing up its special-batch Monster Cookie for National Ice Cream Month. This fun favorite is cookie dough ice cream swirled with peanut butter and chock full of crispy oats, chocolate flakes and crunchy candies. 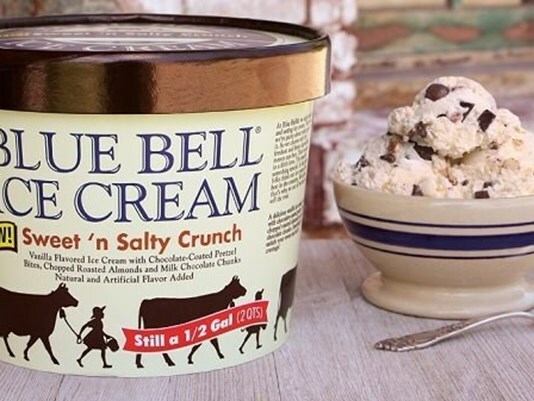 This week, Blue Bell rolled out a new flavor to satisfy sweet, salty and crunchy cravings. Aptly named Sweet ‘n Salty Crunch, this new flavor is vanilla ice cream loaded with chocolate-coated pretzel bites, chopped roasted almonds and milk chocolate chunks. Sweet ‘n Salty Crunch is available in half gallons and pints for a limited time. 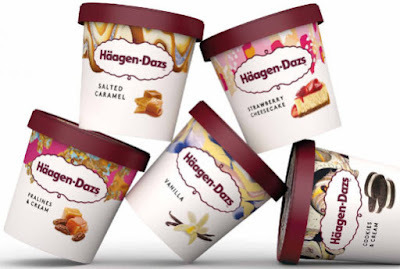 Earlier this week, General Mills made a big splash at its Annual Investor Day at the New York Stock Exchange with the launch of a global refresh of its Häagen-Dazs brand. The makeover encompasses everything from packaging to advertising to the shop experience and reflects the brand’s status as a leader in super-premium ice cream and more broadly, an international lifestyle icon, according to the company. The Häagen-Dazs mission is to make every day extraordinary. The refresh is all about staying relevant with consumers, especially today’s millennial consumers who are looking for brands that share their values and that have a deep, relatable story. Colorful, worldly and fun, the Häagen-Dazs brand refresh includes updated packaging designed by more than a dozen up-and-coming artists. To read and see more, link HERE. Need Ice Cream Innovating Assistance? The Frozen Dessert Center, housed within the University of Wisconsin-Madison Department of Food Science, will hold its first Frozen Dessert Center Conference October 23 to 24 on the UW-Madison campus. Speakers, including myself, will address the scientific, manufacturing and technical aspects involved in the production of ice cream and other frozen desserts. This includes packaging, dairy and non-dairy ingredients, food safety and other trends. Participants will be led through an ice cream sensory evaluation and taken on a guided tour of the UW-Madison’s Babcock Hall Dairy Plant and the Frozen Dessert Center’s pilot plant and lab space. 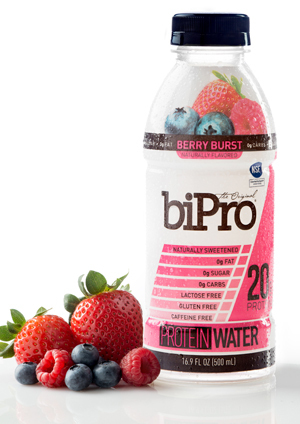 Protein Beverages: Dairy leads the jostling herd of competitors. Think beverages for different dayparts. The consensus appears to be that clean-label formulating is a trend with longevity. Unlike in past years when exhibiting suppliers emphasized managing specific nutrients or eliminating individual additives, this year at IFT, that managing and eliminating melded into the bigger agenda of clean-label formulating. After clean label, editors have different takes on the expo. In my eyes, protein was a leading theme, with animal protein—from cows, eggs and even chickens—in the spotlight. Yes, plant proteins had a very, very strong presence, but when it comes to beverage applications, animal proteins stole the show. Dairy proteins, followed by fiber, will continue to be key drivers of innovation, specifically in the beverage sector, as convenience grab-and-go lifestyle are only speeding up. 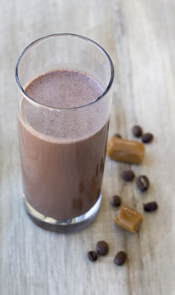 It’s time to add protein beverages to your product line up. According to Euromonitor, the protein beverage market grew by 5.6% from 2015 to 2016 and is expected to grow by 6.1% from 2017 to 2020. The growth is attributed to protein beverages targeted to sports nutrition, adult nutrition and meal replacement. At IFT, attendees learned that protein beverages can be much more than sports nutrition and meal replacement solutions. This was apparent at the U.S. Dairy Export Council exhibit, where USDEC’s team, which includes Ms. Burrington, sampled a Milk & Honey Bedtime Beverage. The concept addressed consumers’ desire to relax after a long, busy day. The milk and honey bedtime beverage prototype contains 20 grams of protein and provides half of the U.S. daily value for calcium. 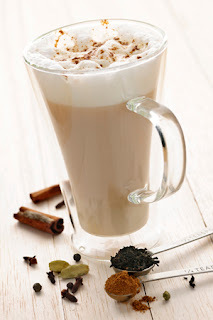 The chai and honey-infused beverage is made with reduced-fat milk, milk protein isolate (MPI) and micellar casein concentrate (MCC). 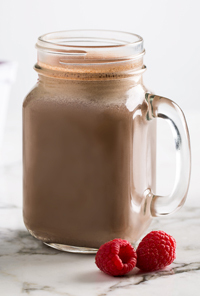 This creamy and nutritious drink can be served warm or cold for a delicious way to wind down after a busy day or intense workout. The taste and nutrition of dairy makes it the complete package for a product that promotes rejuvenation. Ms. Koski explained that there are two main trends creating the need for beverages made for nighttime consumption. The other trend is the at-home café experience, which extends beyond the evening relaxation daypart. This presents an opportunity for café-style dairy protein beverage innovation. 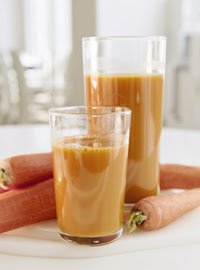 After all, consumers rely on café style drinks to get them through the day. Why not make this experience available when the café is closed for the night? Globally, 53% of consumers believe hot drinks can offer health benefits, unlocking new opportunities for hot drinks that claim to improve health and general well-being. Additionally, 71% of consumers consider re-creating café-style hot drinks achievable or very achievable, increasing the popularity of premium hot drinks for at-home consumption. Ms. Burrington is an authority on dairy protein beverage formulating. She explained in a recent article published for the American Dairy Products Institute that it is important to understand some basic tips for working with dairy proteins to optimize their performance in a ready-to-drink beverage. To read an article I recently wrote on protein beverage formulating for Food Business News, link HERE. Functional considerations include protein hydration, solubility, stability, and of course, flavor. The latter is where dairy shines in the protein ingredient toolbox. If you are interested in learning more, you can attend the Dairy Protein Beverages Short Course at the Center for Dairy Research on October 19. For more information, link HERE. Remember, the dairy industry must stay strong and showcase its inherent powers in the crowded protein beverage marketplace. Get creative. Milk can be so much more than simply milk. Global beverage market analysis indicates that milk is diversifying. The market for mixed milk drinks is growing rapidly, especially outside Europe, according to the organizers of drinktec, which will be held in Munich from September 11 to 15, 2017. Mixed milk drinks and dairy protein beverages will be a dominant theme at the exposition. More than half of all exhibitors at drinktec 2017 announced during the run-up to the trade fair that they would present solutions for the milk industry. The last drinktec was held in 2013 and was attended by more than 12,000 visitors from the areas of milk and liquid milk products. This represented an increase of 58% compared with the previous event. During drinktec 2017, exhibitors will present the entire range of treatment of milk, whey and liquid food. This will extend from cooling and storage by means of thermal preservation, and separators and equipment for skimming, standardization and homogenization through to complete systems for milk and liquid milk products. The soft drinks segment will also be providing milk producers with new possibilities, as carbonized drinks containing milk and fruit juice, coffee or tea are gaining traction in Europe and elsewhere. The drinktec expo is my next trip. Hope to see you there!